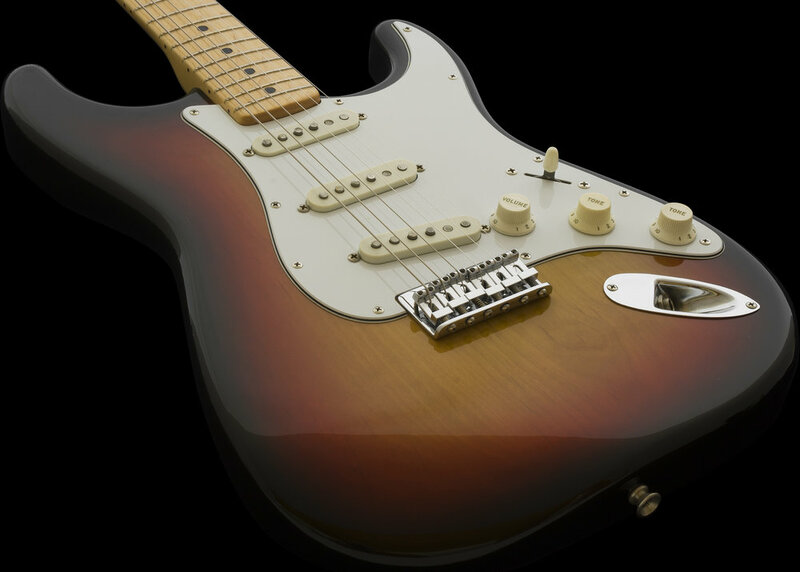 This is a beautiful example of an early 1970's era Stratocaster. 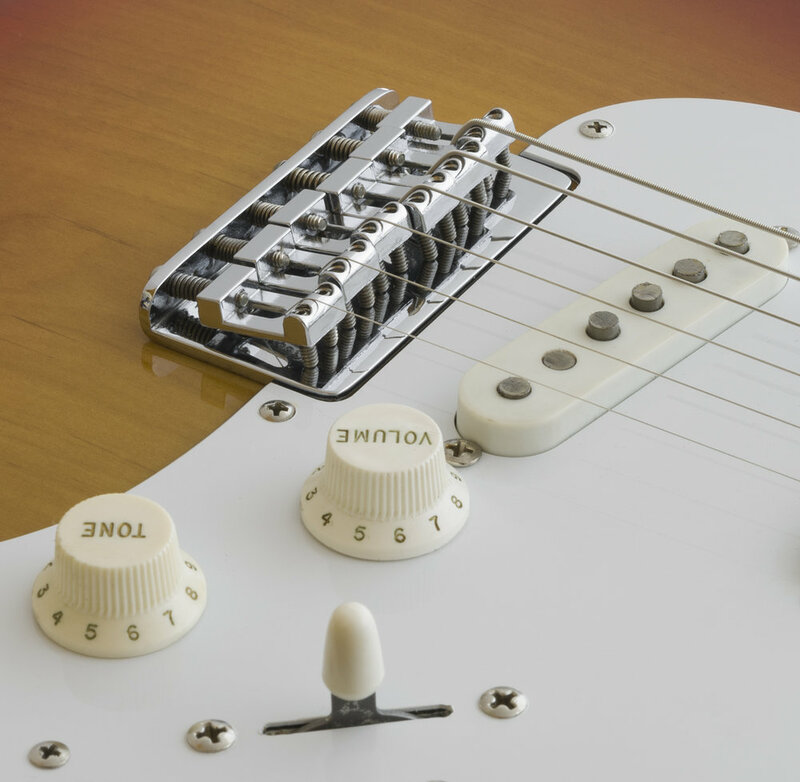 Fender offered Stratocasters without Tremolo units as far back as the mid-1950's, and the tradition continued. For any Strat players not wanting the tremolo unit, these optional models were available for $52.00 less in 1973 with a factory list price of $380.00, if you also wanted the hard shell case. These are a fun alternative that have the solid string feel and tuning stability of a Telecaster but with Strat tone and sounds. 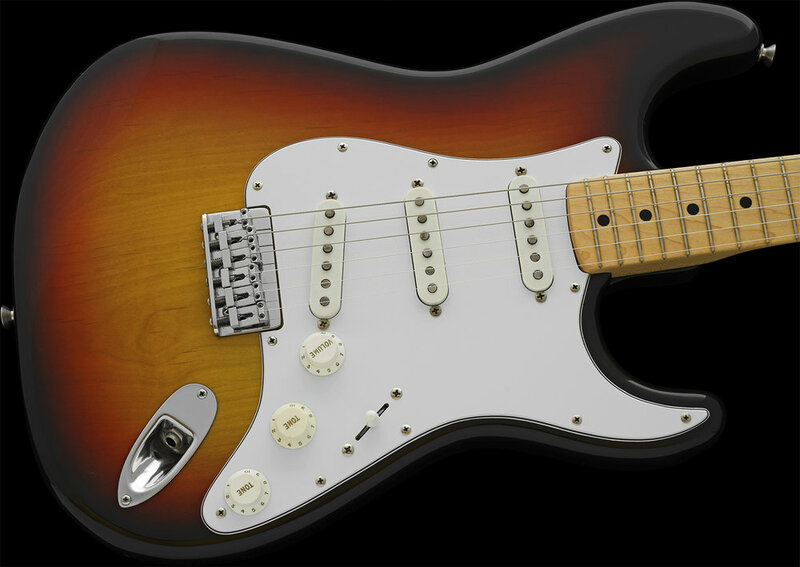 This guitar is finished in the standard 3-Color sunburst (color #500) with a solid maple neck. 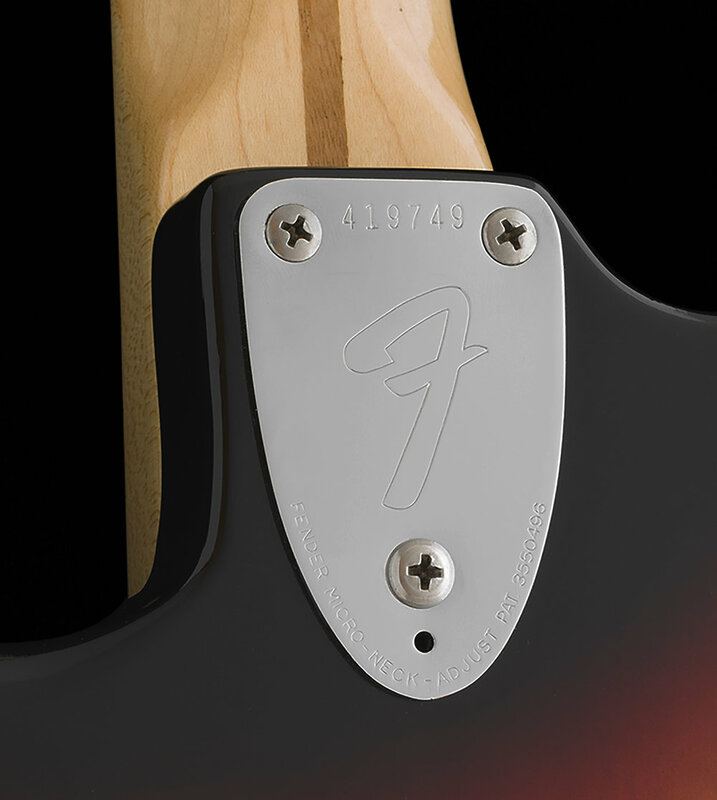 The pickups are the earlier style "staggered" pole magnet design. 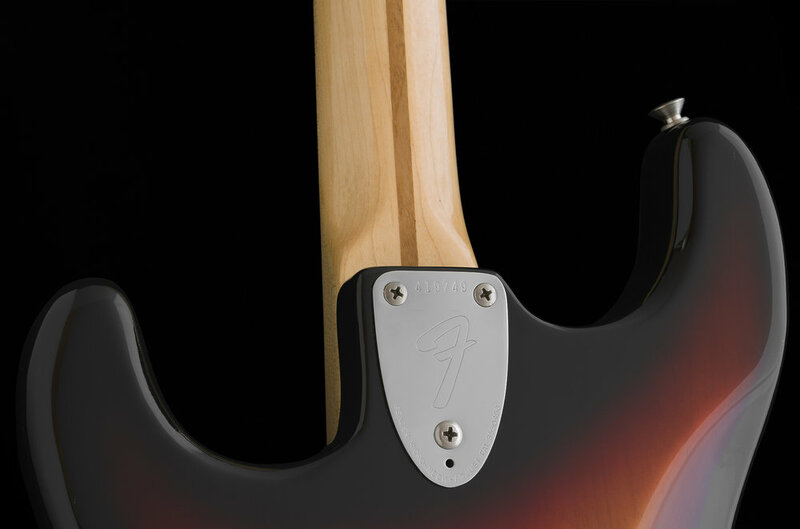 Shortly after, Fender redesigned the pickups to utilize FLAT pole magnets beginning in 1975, and of course, this has the newly introduced in 1971, 3-bolt, micro-tilt feature. I have examined, tested and set-up this instrument and found it to be 100%. The finish, electronics, frets, nut, tuners and all of the chrome plated metal and plastic hardware are all factory correct and original to the guitar. This guitar is still "original" in every way. The electronics have never been altered, and it still retains its 3-way selector switch too. The potentiometers are matched and dated the 10th week of 1973. The neck appears to have never been removed from the instrument, and I have decided not to disturb it as I see no reason to do so. 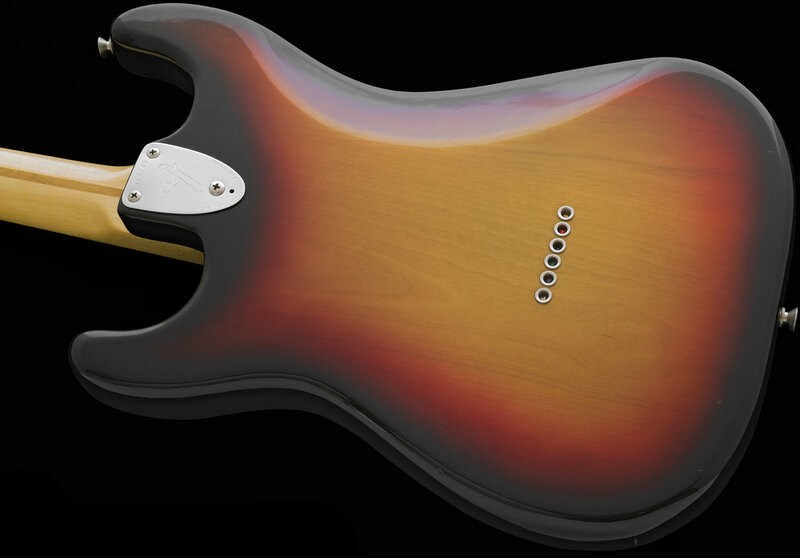 The 3-color Sunburst was nicely applied over a lightweight Alder body, and it looks beautiful in my opinion. All of the parts and finish are in equally clean, unused and matching condition. The instrument seems to have been played a small amount when it was new, but likely only at home. Globally there are a few small marks and or small impressions on the guitar, but I stress a "few." Some are located on the back, a couple on the face and few on the sides, however, the overall takeaway is that this is a crisp, clean and remarkably well-preserved guitar as my large and clear photographs show. The CASE is the original issued factory correct Black Tolex model with Orange lining. It is in immaculate, matching condition with fully functioning latches, hinges and handle. The guitar has just been set up with a fresh set of D'addario XL 10-46 gauge strings. I acquired this guitar more than 25 years ago, and because it is such a beauty, I added it into my Fender collection. I enjoy collecting factory-original guitars from the 50's, 60's and 70's too if they meet my criteria. The early 1970's Strats were not particularly rare, even back then, and finding unmolested, museum quality examples was never easy, then or now. Eventually, word got out that I was after better examples of vintage instruments and I paid more for them than the other local vendors, which is how I was able to build up a higher quality collection and the impressive store inventory I always had. Thanks to a couple of savvy and knowledgeable guitar finder friends with whom I worked with here in Southern California throughout my store career, I was able to assemble an impressive array of stunning, unmolested instruments, some of which I am proud to be able to offer for sale today. This guitar is now 45 years old and has been stored for almost 3 decades and is essentially an "uncirculated" vintage specimen. If like me you are a discerning Fender collector, then you may be as enamored as I am with owning a genuine factory-original and well-preserved Vintage Strat. Kindly do inquire.